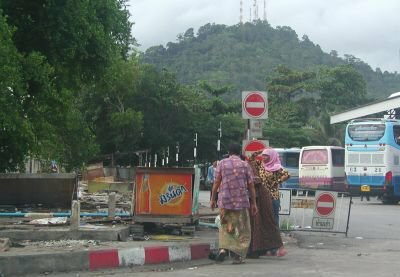 PHUKET CITY: After five months of resisting an order to leave their premises at the Phuket City bus terminal, six shopkeepers have finally been evicted and their stores leveled to make room for more parking space for sorng taew. Teerayuth Prasertphol, Chief of the Phuket Provincial Transportation Office (PPTO), told the Gazette yesterday that the long-awaited court order, filed on May 4, to evict the shopkeepers was finally approved September 20. On that day PPTO officers and police arrived to enforce the order. The shopowners at first refused to move, but soon changed their minds when On-anong Kamsiri was arrested for trespass and fined 60,000 baht. All the other shopkeepers agreed to close immediately and vacated the land the next day. They even paid out of their own pockets to have the buildings demolished on September 25. Not present for the eviction was Mayuree Keesun, the longest-staying tenant at the bus station. She set up shop there 32 years ago, before the bus station was built. She added that she believed that because – as on many previous occasions – she had heard nothing from the PPTO or the court for such a long time, the matter had simply been forgotten about. “I was wondering why the story was quiet for such a long time, until the police arrested a shopowner. “I am still wondering why the court did not notify me that the order had been approved before the police came,” she said. The area around the bus station is currently undergoing a commercial boom. Many shops have opened on the neighboring plots in the past few months, including market stalls in a two-story complex and a large karaoke and seafood venue.